When Police Uncovered Juju In A Calabar Church! Calabar, the Cross River State capital has in the past few weeks witnessed some strange events with some astonishing rapidity, leaving many residents to wonder what has become of their once serene and peaceful city. Beginning with the importation of poisonous snakes and hundreds of other tropical rainforest animals in the first week of August to the explosion at a tank farm which left many dead to the lynching of five persons for “one chance” robbery to the arrest of a pastor for kidnapping and slaughtering of a one year a six months old baby for ritual in the last week of the month , many residents have been left with mouths agape. Among the myriad of man-made strange happenings, the one that has left many wondering if this is still their beloved Calabar is the kidnap and slaughter of a one-year-old Success whose heart was found in a white basin in a church, God’s Commandment Ministry, used for ritual by the pastor of the church, Pastor Anthony Obo. According to Faith Inyang, the twenty year old mother of the girl, on the night of 23rd August, she and other family members were sleeping in their apartment when some people armed with machetes and bottles broke the door and went into the room and abducted her little daughter who was sleeping beside her and went away. “They beat us with machetes and abducted Success from where she was sleeping beside me and took her away and we started crying and a neighbour came out of his room to ask what was the matter and we told him some people abducted Success and he rushed to the junction and saw five of the people and they threatened him with machetes but he recognized them and called their names”. She said the neighbour walked along with the kidnappers and when they got to the Pastors church, they entered and asked him to wait outside and he waited for a long time before leaving since they failed to come out again. “Before that night one of them, Okon Ekpo came to me and asked if Success was my daughter and I said yes and he told me he loved me and would take care of me and said many things before leaving which I think was surveillance because it was that night that the people came and took Success away”. Faith narrated to Saturday Vanguard. Search for the kidnapped girl took a whole day, this was the Thursday following the Wednesday night she was abducted, before the police at Uwanse Division in Calabar South was intimated of the incident and they stormed the church located at Okon Edak street off Atumunu Road, the same street where little Success was abducted. A search in the church by the police led to the discovery of a heart in a white bowl, blood in a red bucket, a miniature canoe filled with charms and fetish materials, chairs covered with red and orange clothes, bags containing photographs of several men and women, keys where the pictures of men and women are tied together and several other fetish items which gave rgw place out as an occult house rather than a church. Following the discovery, on Friday morning an irate mob descended on a branch of the church located at 6, Abua street, off Edgerly Road and set it ablaze to avenge the killing of the girl. When the pastor and his accomplices were paraded by the police at the Command headquarters at Diamond Hill on Tuesday following reports that he had been released , he remained defiant, claiming that the blood and heart found in his church were those of a goat and a chicken he killed during his prayer sessions . “The red chairs covered in white sheet and the black bag and other occult items were used by the youth of my church for art and drama presentation while the blood in the red bucket is that of the goat and chicken I killed to celebrate the dedication of my child who was one year last week”. He watched without displaying any emotion as the police displayed the fetish items which he had been using for his ‘pastoral” activities which more or less had the outlook of a shrine. The place emitted awful stench. 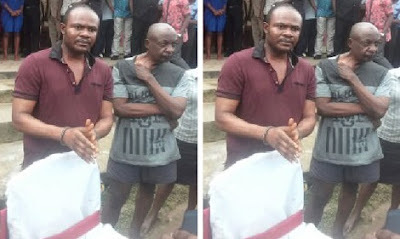 The Cross River Police Command spokesperson, Ms Irene Ugbo said the pastor and his accomplices were arrested following a confessional statement by one of the suspects that they were sent by the pastor to abduct and kill a baby whose heart was put in a basin and handed over to him. » When Police Uncovered Juju In A Calabar Church!